Hello and happy wine Wednesday to you all! I hope your week is going well so far and you are trying some new and interesting wines! Personally, I opened a bottle of Le Vieux Pin‘s Sauvignon Blanc which was elegant and refreshing. I had only tasted it briefly when I visited the winery and met the winemaker, Severine Pinte-Kosaka, last summer. Enjoying a full glass of this stunning wine and introducing it to a couple we hosted for dinner indeed was a highlight. In class last night we focused our tastings on the white wines of Chablis, Grand Auxerrois, Côte de Beaune, Côte Chalonnaise and the Mâcon. Beaujolais was to be looked at as well but ran out of time and instead learned about two, almost obscure, regions of France – Jura and Savoie. Last night’s class gave me a few ‘firsts’ at tasting wines and unique varietals. The white wine tastings provided some hits and some misses for me. An interesting stand out was the only Sauvignon Blanc AOC in Burgundy – Saint Bris AOC. I have never tried a Sauvignon Blanc from Burgundy and didn’t know that it even grew there! I had my first taste of Aligoté in the Bouzeron AOC wine – NOT a fan. La Chablisienne Sauvignon 2012 Saint-Bris AOC (12.5%) $18.99 This was light, easy version of Sauvignon Blanc. If you prefer your New Zealand SB’s – then this isn’t for you. I enjoyed its simplicity, light body and the notes of citrus and mineral. William Fèvre ‘Montée de Tonerre’ 2007 Chablis Premier Cru AOC (13%) $68.00 Why do I always gravitate to the expensive wines??? This was so delicious and complex with mineral notes, juicy citrus and a long finish. A favourite. Domaine Ramonet 2011 Bouzeron AOC (12.5%) $42.99 This is the Aligoté. Delicate on the nose with floral notes and it felt like it coated my tongue in clay. I feel that there is no value in this bottle of wine and would have no trouble finding others at this price point to enjoy again and again. Strongly dislike. 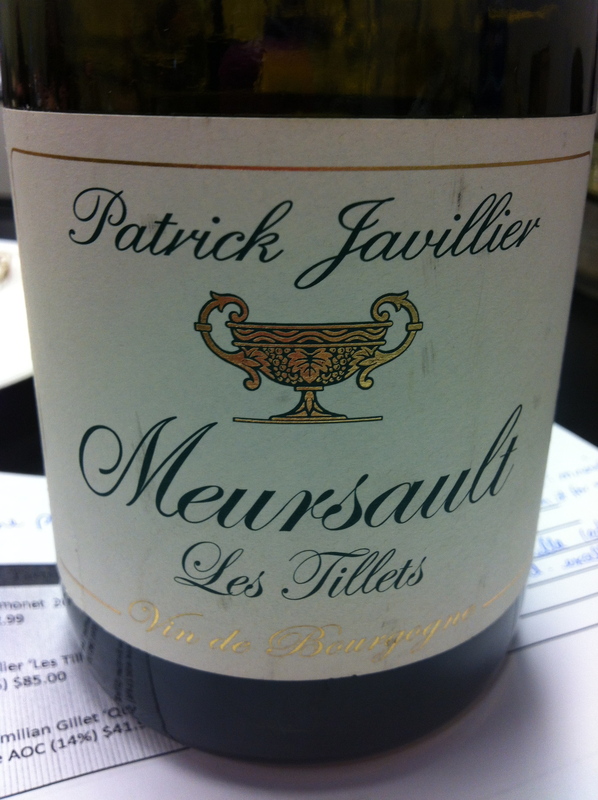 Patrick Javillier ‘Les Tillets’ 2006 Meursault AOC (13.5%) $85.00 ARG – here we go again – the most expensive bottle just happens to be my favourite. 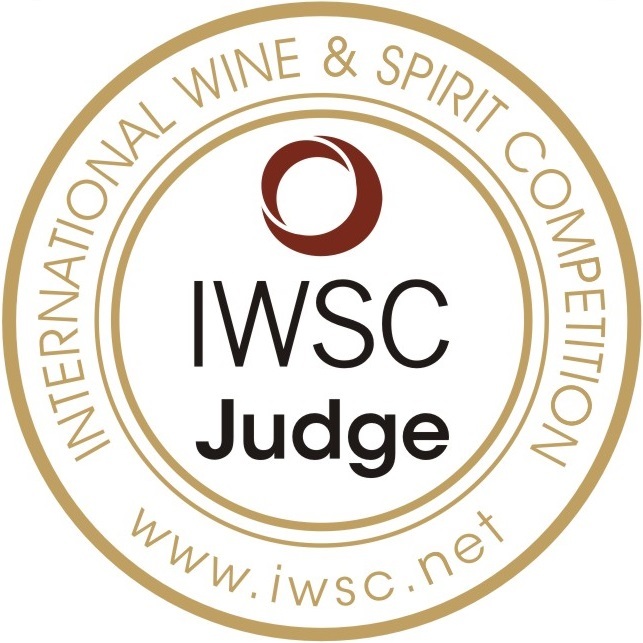 Stunning and full-bodied with a rich, nice acidity and excellent notes of red apple, baking spices and butter. This is a ‘Hell Yes’ wine and worth the price. Photo above. Domaine Émilian Gillet ‘Quintaine’ 2009 Vire-Clessé AOC (14%) $41.99 Now this was funky and I am not sure if I mean in a ‘good’ way. This is a Chardonnay wine with some botrytis-affected fruit vinified into a ‘dry’ style yet had notes of bold spice, someone in class said ‘honeycomb’ which I agree with and simply just tastes odd to me. Not for that price point, thank you. Definitely an ‘In the mood?’ category! Holy moly – there are so many villages, vineyards and AOC’s in Burgundy…my head was spinning with the information coming at me! In a nice change of pace, we studied Jura and Savoie regions next which are located in eastern France in between Burgundy and Switzerland. The Jura region is made up mostly of Chardonnay and a grape called Savagnin Blanc which is a specific grape to Jura and their main red grape is Poulsard. The Côtes du Jura AOC wines are rustic, earthy and getting increasingly popular due to their natural winemaking approach. The Château Chalon AOC is a region that grows only Savagnin Blanc used for the making of ‘Vin Jaune’ which is a Sherry-like wine. This region is also known for their ‘Vin de Paille’ (Straw Wine) where grapes are dried for a minimum of 6 weeks on a bed of straw. This is a naturally sweet wine. Savoie sparkling wine – still waiting for price point but believe it is under $30. Fantastic and was one of the highlights for me! Savoie, originally, was the Kingdom of Savoy whose kingdom spread throughout the Alpine regions of Switzerland, Italy and France. Savoie’s close approximation to bodies of water enables grapes to be grown here. The grape varietals are mostly white with some interesting varieties I had not heard of before such as Jacquère and Mondeuse Blanche (who is a parent grape of Syrah). The Vin de Savoie AOC: sparkling category got my attention as they use the traditional method of production and is a blend usually of Gringet & Rousette grapes. Domaine Rolet et Fils Vin Jaune (14.5%) AOC Vin Jaune $46.99 for 375ml bottle. I didn’t think I was going to like this and I did – quite a bit. It smelt like nuts and almond and salt and an interesting ‘yeast’. It has a nice, light mouth-feel and paired with almonds and olives – this would be an excellent aperitif. Wow – did I already mention that my head is spinning from all the information I am packing into it? 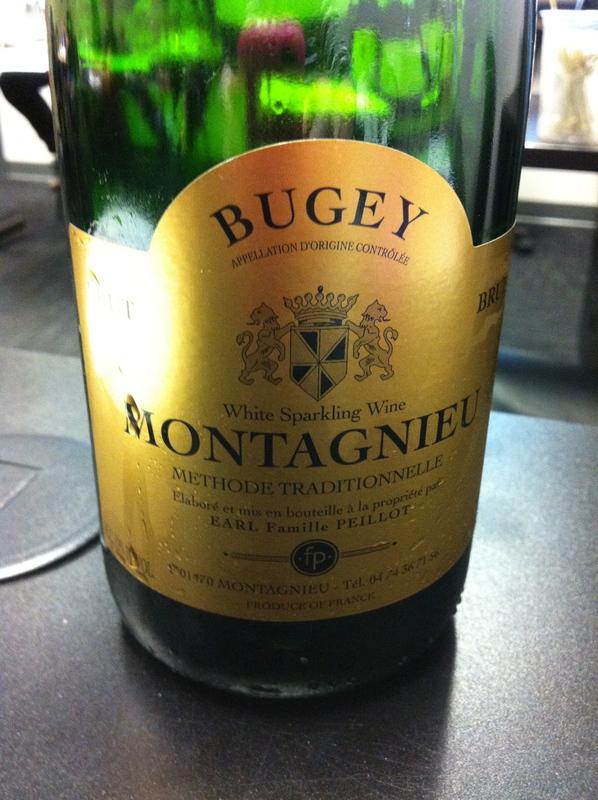 I am so thankful that this class started out with less complex regions before moving into Burgundy. It is so multi-dimensional that I can only hope to appreciate over time with LOTS of studying! That is it for this week. I hope you are keeping healthy and well and discovering new wines to enjoy!